Jane Healy is a diehard booster of the blue-collar south suburb of Blue Island, and she’s the ultimate biker mama. Along with her husband Mike and kids Will, Katie and Genevieve, she usually pedals to get around this scruffy railroad town of some 22,500 people, located just south of Chicago and straddling the Calumet-Sag Channel. 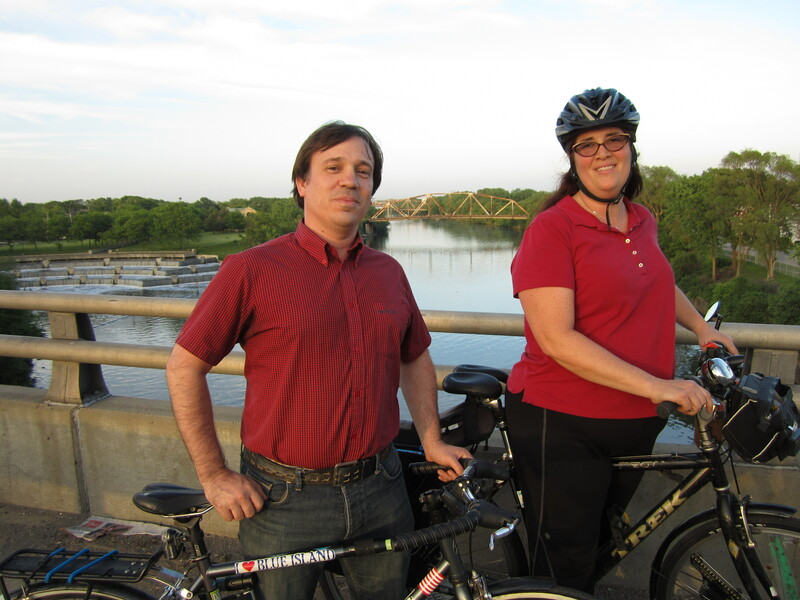 Jane is board president of the Active Transportation Alliance advocacy group, and she’s been spearheading Blue Island’s current bike boom, helping get hundreds of local kids jazzed about cycling. 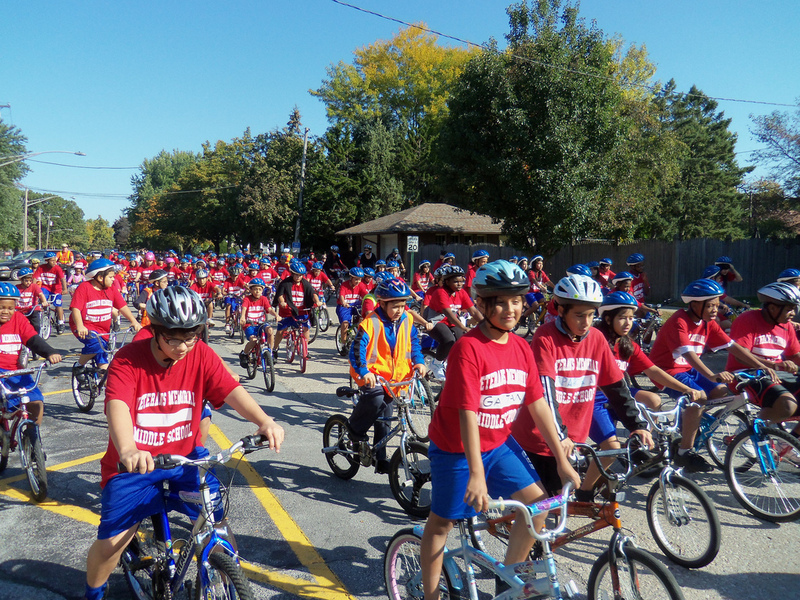 In 2006 Healy got the idea to lead a “bike train,” escorting a group of children to and from her kids’ school on cycles. “Pretty soon every time I’d open my garage door I’d have hordes of small children running toward me asking to go on a bike ride.” Soon she found grant money to launch Cal-Sag Cycles, an earn-a-bike program where teens learn bike safety and repair skills and build their own Fuji hybrids. “A lot of the kids are very at-risk and are targeted for help by their teachers,” she says. “One kid, Rodsean, was struggling, but he’s a smart kid who’s really good with his hands.” Rodsean flourished in the program and eventually wound up working as chief mechanic for the school district’s annual Bike Day, which draws some 500 students for a Critical Mass-style bike parade through the town. The city is located on a six-mile-long glacial ridge that also runs through Chicago’s Beverly and Morgan Park neighborhoods from 87th Street to 130th Street. Back when the region was covered by ancient “Lake Chicago,” the precursor to Lake Michigan, this land was literally an island. “After the lake receded, black oaks grew on the ridge, and early settlers thought it looked like a blue island standing in the prairie,” Healy says. The town of Blue Island was founded in 1835 as a way station for travelers along the Vincennes Trail, now Vincennes Avenue, from southwest Indiana to Chicago. In the 1860s Healy’s mother’s family came to Blue Island from Germany as part of a wave of German immigration that lead to four breweries being founded here, and the beer industry continued here until Prohibition. 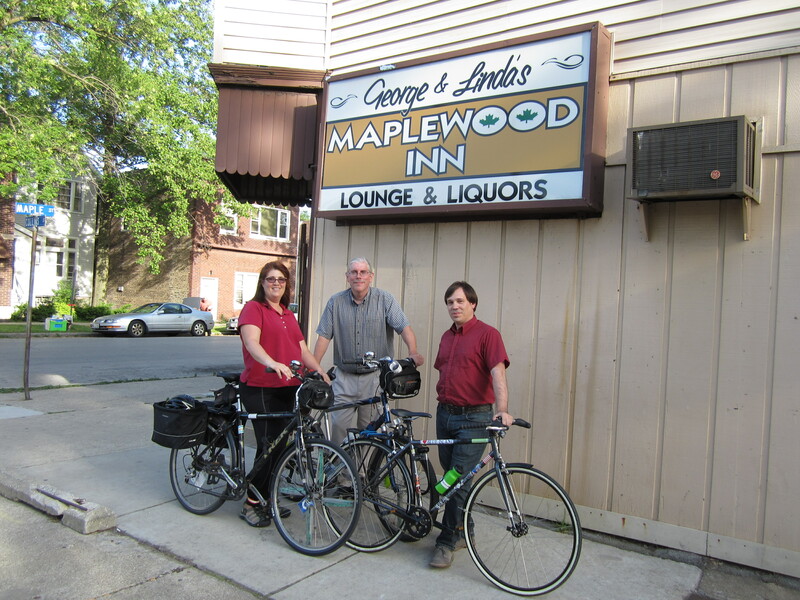 As befitting a town with a rich brewing history, Blue Island has a gaggle of good bars, so after I ride Metra’s Rock Island Line to 119th Street and hike ten minutes to Jane’s house, she fits me out with a bike and we hit the road with Mike to visit a few of them. After rolling down a shady residential street lined with bungalows we come to the Maplewood Inn, 12432 Maple Avenue, a cozy wood-paneled tavern. Jason Berry, an urban planner with the city of Blue Island meets us there, riding a bike with an “I Love Blue Island” sticker. We just lean our rides against an outside wall—Healy says there’s no need to lock them in this relatively sleepy burg. A place for laughter, and cheer. A place to relax and sip a beer. A place for games, pool and fun. A place to just sit and rest your buns. One of the fun things about this town is that its rolling topography is a departure from pancake-flat Chicago. To demonstrate, Jane takes us to “Dead Man’s Gulch,” a steep cobblestone alley that dips down to cross a street and then rises up again. Bombing the hill is a rite of passage for Cal-Sag Cycles kids. “When you can go down Dead Man’s Gulch without hitting your brakes you have earned the badge of courage,” Jane says. Next we roll to Haas’ Tavern, 12725 Western Avenue, whose exterior wall still sports a faded “ghost sign” mural ad for the defunct Gettleman beer company. Inside the dive features framed portraits of Richard J. Daley, FDR and Harry S. Truman, as well as a defunct shuffleboard table. Mike grew up in the area and tells us he used to hang out in this bar when he was nineteen, shortly before the drinking age was raised. We cruise the careworn Western Avenue business district then stop on the Western bridge over the channel to take in the surprisingly breathtaking view. A couple of other rusty spans are visible to the east, as well as a water aeration station that looks like a large stair-stepped waterfall. Its purpose is to add oxygen to the canal so that fish can thrive. Jane tells me University of Chicago crew teams row on the canal, and a couple of motorboats speed by as we gaze at the water. Next we check out a dilapidated bridge over the Little Calumet River, which meanders from the Cal-Sag southeast to Indiana. The river is flanked with lush vegetation and it almost feels like we’re hanging out on the bayou. 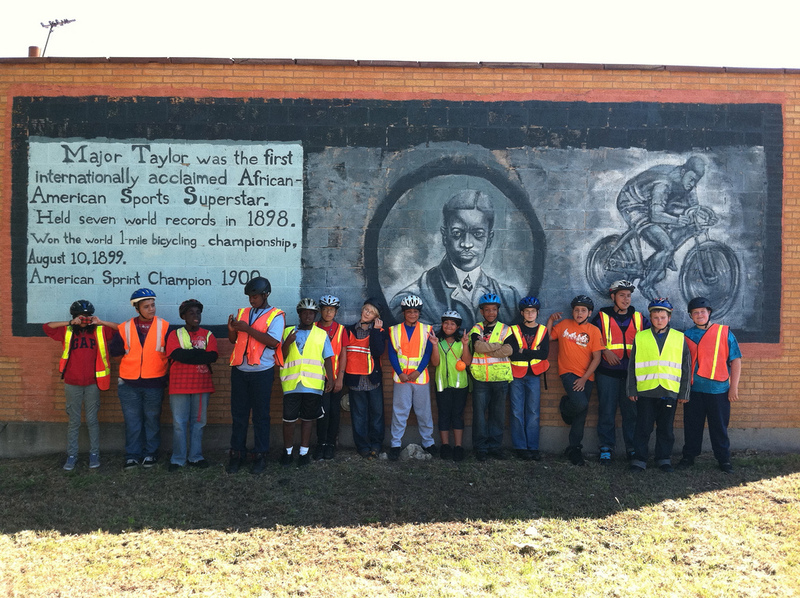 A retaining wall nearby is covered with colorful graffiti. “That’s what’s great about Blue Island,” says Berry. “It’s forgotten enough that this stuff still exists.” We backtrack to the Riverside Tap, 13351 Aulwurm Drive, a bar with a huge backyard where brawny men in ball caps and sleeveless t-shirts pitch horseshoes in multiple horseshoe pits. After that we roll down to the Maple Tree Inn, located below the Western Avenue bridge at 13301 South Olde Western, featuring some of the best New Orleans-style food in the region. Mardi Gras posters and giant masks are on display, and Trombone Shorty and other Crescent City favorites play on the sound system. Jane points out that the beautiful wooden back bar is the original one from the Schlitz pavilion at the 1893 Columbian Exposition. Streets for Cycling meeting – South Side Check out a draft of the Citywide 2020 Network for a 640-mile bike network, and provide feedback to city staff. Thursday, May 31, Gary Comer Youth Center, 7200 South Ingleside, facebook.com/streetsforcycling2020, 4pm-8pm, presentations at 4:30pm & 6:30pm; free. Bike-in movie at Heritage Bicycles Chicago’s bike shop café shows the Chicago-area-set comedy “Wayne’s World” on their outdoor patio. Friday, June 1, Heritage Bicycles General Store, 2959 North Lincoln, (773)245-3005, heritagebicycles.com, 8pm; free. Bus Rapid Transit happy hour The Congress for the New Urbanism hosts a discussion of the city’s plans for a BRT corridor on Western Avenue. The event includes a short tour of the avenue to look at the issues involved with retrofitting the street. Thursday, May 31, Floyd’s Pub, 1944 North Oakley, tinyurl.com/brthappyhour, 5:30pm; free. First Friday Ride Take a leisurely nighttime tour of the city with members of the Chainlink in search of poutine, a Canadian snack consisting of fries with cheese curds and gravy. Friday, June 1, The Globe Pub, 1934 West Irving Park, (312)772-5060, firstfridayride.com, 8pm; free. Transport Chicago conference This annual symposium covers a wide range of transportation modes and issues, including walking, biking and transit. Friday, June 1, American Dental Association, 211 East Chicago, info@transportchicago.org, transportchicago.org, 8am-5pm; $70, $35 for students. Tour of Irving Park Learn about this unique Northwest Side community, filled with notable architecture like the Villa District and Carl Schurz High School, on this seventeen-mile guided bike tour by history buff Lee Diamond. Saturday, June 2, Horner Park, 2741 West Montrose, (773)255-6347, chicagovelo.com, 11am-3pm; $9. Bloomingdale Trail access park meeting Come discuss the design of a new park at Kimball and Spaulding that will provide access to the future elevated greenway. Tuesday, June 5, Funston Elementary, 2010 North Central Park, bloomingdaletrail.org, 6pm; free. Streets for Cycling meeting – West Side Check out a draft of the Citywide 2020 Network for a 640-mile bike network, and provide feedback to city staff. Wednesday, June 6, Douglas Park Cultural Center, 1401 South Sacramento, facebook.com/streetsforcycling2020, 4pm-8 pm, presentations at 4:30pm & 6:30pm; free.